The photo on the left is a banana leaf, if you are wondering. Yep, it's from 'a bug's life' day, when I went to the garden and photographed lots of leaves from their underside. I got carried away and shot all kind of leaves in the garden. Anyway, I kept thinking on how useful the banana plant is...I know because in my place of origin [Minahasa] we cook the inner most part of the banana trunk into a delicious dish. But that's not all the product of the banana tree, as you will see. Of course the banana fruit is famous, everybody eats it. But, did you know that the banana fiber could be made into textile and paper? 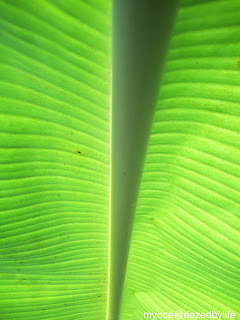 The banana plant has long been a source of fiber for high quality textiles. In Japan, the cultivation of banana for clothing and household use dates back to at least the 13th century. In the Japanese system, leaves and shoots are cut from the plant periodically to ensure softness. The harvested shoots must first be boiled in lye to prepare the fibers for the making of the yarn. These banana shoots produce fibers of varying degrees of softness, yielding yarns and textiles with differing qualities for specific uses. For example, the outermost fibers of the shoots are the coarsest, and are suitable for tablecloths, whereas the softest innermost fibers are desirable for kimono and kamishimo. This traditional Japanese banana cloth making process requires many steps, all performed by hand. In another system employed in Nepal, the trunk of the banana plant is harvested instead, small pieces of which are subjected to a softening process, mechanical extraction of the fibers, bleaching, and drying. After that, the fibers are sent to the Kathmandu valley for the making of high end rugs with a textural quality similar to silk. These banana fibre rugs are woven by the traditional Nepalese hand-knotted methods. Banana fiber is also used in the production of banana paper. Banana paper is used in two different senses: to refer to paper made from the bark of the banana plant, mainly used for artistic purposes, or paper made from banana fiber, obtained from an industrialized process, from the stem and the non utilizable fruits. This paper can be either hand-made or made by industrialized machine. Now I'd like to tell you about the most delicious product of the banana plant...which is from its fruit, it is called Pisang Goreng here in my country, or in English : fried banana. Pisang goreng is a snack food mostly found throughout Indonesia, Malaysia and Singapore. In Singapore it is known incorrectly as Goreng Pisang. It's popularly consumed as snacks especially in morning and afternoon due to its warm nature in serving. In Indonesia, Pisang Goreng is usually sold on street market, although some sellers now have a kind of retail store to sell the product. Pisang Goreng Pontianak are widely popular in Indonesia and exclusively sold in certain retail outlet. The Banana is battered and deep fried. The fritters that result are often sprinkled with a cinamon sugar and occasionally served with fresh cream [ myoce : although generally we serve traditional pisang goreng without additional spices].Today's Pisang Goreng are more sophisticated and served in various ways, like being served with cheese, jam or chocolate. [ myoce : or you could try melchan's way of eating pisang goreng, : dipped in hot chilly sauce...hm.. yummy!..so she says ]. The banana used are usually plaintain as the batter usually adds some flavour to the banana. Pisang Raja is a popular kind of Banana used for Pisang Goreng. 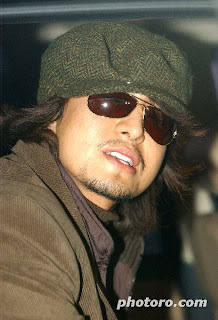 You are probably wondering, what is a photo of Yong Joon ssi doing in a post about bananas?? More ever, even the bananas are not shown here, only the leaves ! 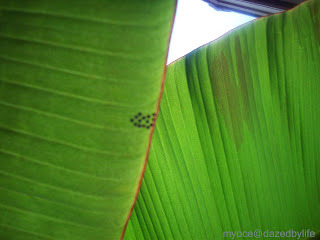 Sources : Info from Wikipedia, Pics of banana leaves by me, pic of BYJ credit as labeled. Plantain= bananas for cooking, different from the soft banana for eating raw. Plantain is firmer and lower in sugar content.